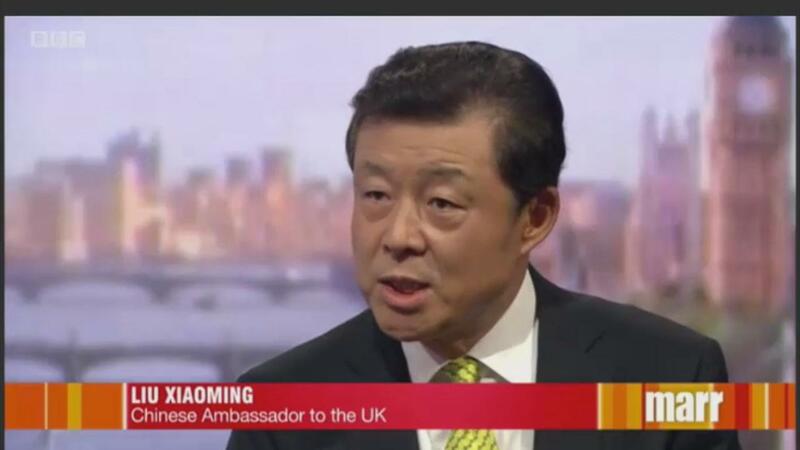 Andrew: Ahead of the State Visit by the Chinese President, I am joined by the Chinese Ambassador to the UK, Liu Xiaoming. Welcome, Ambassador, very nice to have you here. Andrew: First of all, about Britain's relationship with China. Are we in essence now a begging bowl economy, as far as the Chinese state is concerned, which doesn't have the right to raise issues like human rights? Liu: First of all, I think China and the UK are partners. We call it comprehensive strategic partners, because our two countries are very import countries with global influence. We have so many areas for cooperation, for win-win. When you talk about human rights, I think that is also an area we can talk about. But the important thing is how to approach human rights. When you talk about human rights, you should not miss the big picture in China. I hope people would realise how much progress China has made in the area of human rights. Andrew: So this is a changing picture, and the President won't be offended if it is brought up, for instance, at the banquet by the Labour Leader Jeremy Corbyn, who says he will bring it up? Andrew: But there are a lot of dissidents who are in prison for expressing their views. Liu: But I wouldn't say there are a lot of dissidents. All criminal are tried through a normal legal process. Andrew: But there are people who express criticism of the Chinese government and the state, whom we would not regard as criminals, who end up in prison in China. Liu: No one would be put behind bars simply because they are criticizing the government. The criminals are put behind bars because they have a criminal record. They either incite or engage in organization to overthrow the legitimate government. Here in this country, I think, once you are involved in some activities that work against the interests of Britain and endanger the safety of the people, you will be put behind bars. Maybe we have some different opinions, but we can talk to each other. Andrew: Well, let me give you a specific if I may, Ambassador. The most important and exciting art exhibition we've had in London for a very, very long time is the Ai Weiwei's exhibition at Royal Academy. Here is somebody who is a global Chinese figure. And he is a Chinese patriot, very, very proud of his Chinese origins, and his father was close to Chairman Mao and all the rest of it. Yet he ended up in prison for a while. Do you regard him as a dissident, as a dangerous figure or as a patriotic important Chinese citizen? Liu: I don't know how much you know about this so-called "artist". I was interviewed on one of your programmes. I told the presenter, he is not my taste. There are so many talented Chinese artists. Yet … and many are much better than him. Why is he so famous here? Because he is critical of the Chinese Government. He has never been put behind bars. He was under investigation because of his economic crime. He was suspicious of fraud accounting, destroying accounting documents. What about … the same artist, do you investigate into him if he has this criminal record in the UK? Andrew: The only thing I could say is that we disagree about this. I think he is a great artist. I'll have to say it's a great exhibition. We can disagree about that and move on. Is the Chinese Government offended by the Prince of Wales' decision not to attend the banquet? Andrew: Can I ask, I am so sorry to interrupt you, can I ask about the stories that British security and intelligence experts have warned our government that China is getting very, very close to the heart of state security through this nuclear contracts. And in a sense, they are opening the door to things that most governments, including the Chinese government, wouldn't allow. Liu: I don't know where they get this information. I can only tell you that Chinese are here for win-win cooperation. 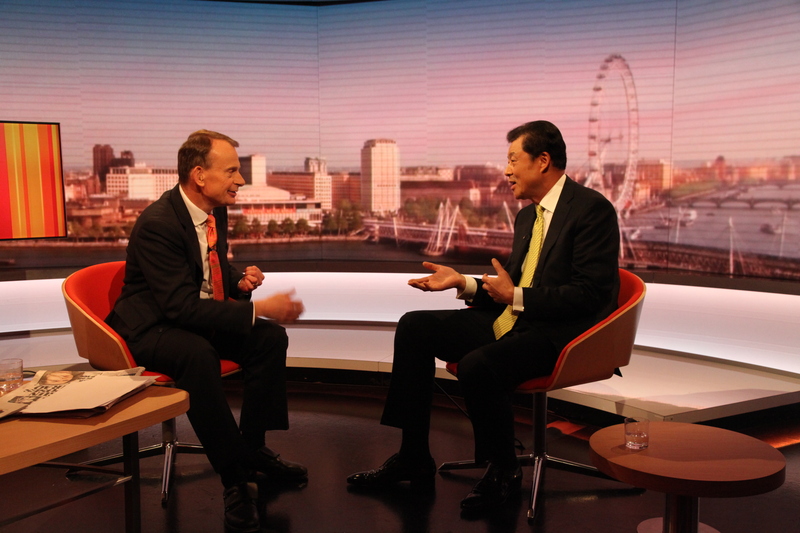 We think it is in the best interests of Britain and also in the interest of partnership between China and Britain. I think that the UK need Chinese investment here and UK people want to have a better life, want to have a clean energy. I know you have to get rid of the old nuclear power stations in the next dozen of years. You have to find resources for the new supply. Andrew: We certainly need the money, we need the expertise. But China wouldn't allow a foreign power to build her nuclear power stations surely? Liu: I was put to the same question. I ask, do you have the money, first. Do you have the technology, do you have the expertise? If you have all these, we certainly would want to have cooperation with you. Like France, you know, the French nuclear services, we have some cooperation with France, because they have the technology. I think the UK is strong in other areas. Why do you always focus on building nuclear power stations in China? Andrew: We're expecting a big contract to be signed next week. Do you think it will be? Liu: I certainly hope so, because it is a very important project between our two countries. Andrew: And finally, just you said earlier on that you didn't think that Jeremy Corbyn would raise human rights at the state banquet. I mean, his people have been briefing that he will. If he does, what happens? Andrew: So your advice is not to do this in public? Andrew: Yes. Ambassador, thank you very much indeed for joining me. And good luck with the State Visit. Andrew Marr Show is one of the most influential political programmes on BBC, where the UK's Prime Minister and other Cabinet ministers give interviews. It has a TV rating of 5 million audiences. Andrew Marr is a well-known British presenter who has interviewed US President Obama and Russian President Putin.